Freakin' New Guy 2nd Tour, Vietnam squad combat rule book for miniatures or counters. "The oppressive jungle heat causes small beads of sweat to trickle down your brow. Or is it the fear? waiting to bushwhack the tired or unwary. Does that bush hide a machine gun? Tunnel entrance under that clump of leafs? Maybe there's a sniper lying in wait up in that tree?" Your squad looks to you for leadership, for knowledge, for guts. Do you have what it takes? just another Freakin' New Guy in The Nam? 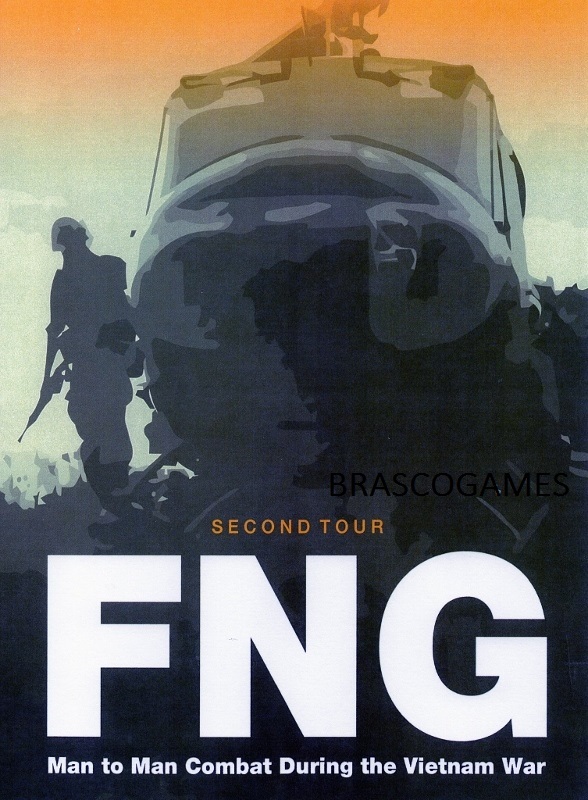 FNG Second Tour (FNG2T) is the second edition of FNG. We've streamlined the mechanics and kicked up the realism. FNG2T gives you what you need to run your grunts through infantry combat in Vietnam during 1967-1968.
yourself or with friends all on the same side! FNG2T is designed to be played with one figure representing one man and in any figure scale you may already have. Artillery, air strikes, helicopter gunships, bunkers, tunnels, and more. FNG2T has them all and much more. 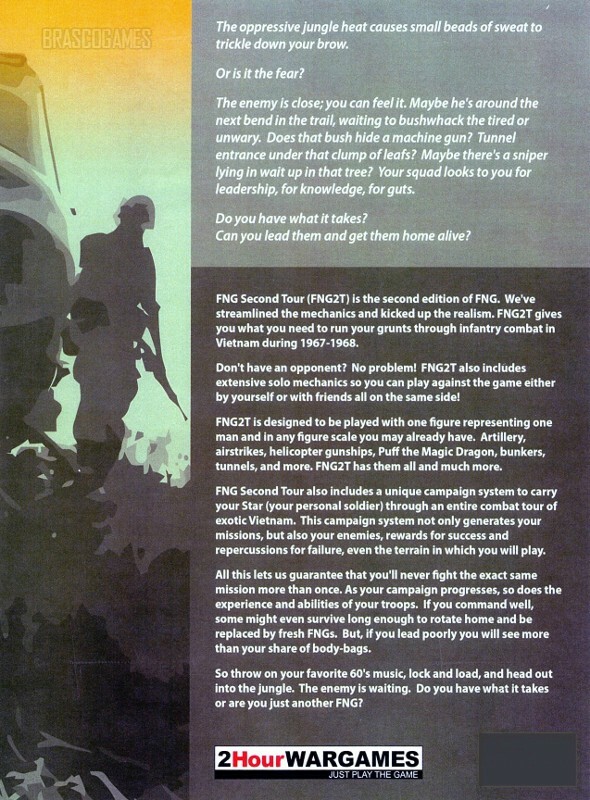 FNG Second Tour also includes a unique campaign system to carry your Star (your personal soldier) through an entire combat tour of exotic Vietnam. This campaign system not only generates your missions, but also your enemies, rewards for success and repercussions for failure, even the terrain in which you will play. All this lets us guarantee that you'll never fight the exact same mission more than once. As your campaign progresses, so does the experience and abilities of your troops. FNGs. But, if you lead poorly you will see more than your share of body-bags. So throw on your favourite 60's music, lock and load, and head out into the jungle. The enemy is waiting. Will you have the guts, or will you be?just another FNG? Card stock cover - 118 pages - A4 size - Combi Bind book.